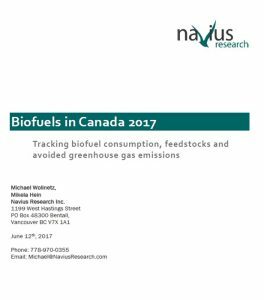 Navius Research has released the 2017 edition of the “Biofuels in Canada” report. This report uses public data to catalog the volume of transportation biofuels consumed in Canada while estimating the impact of biofuel consumption on greenhouse gas emissions and transportation energy expenditure. Ethanol consumption has increased from roughly 1,700 million liters in 2010 to 2,800 million liters in 2015, accounting for over 6% of fuel consumption in the gasoline pool. Renewable fuel in the diesel pool has increased from 160 million liters in 2010 to 620 million liters in 2015, accounting for roughly 2% of diesel fuel consumption. Annual avoided lifecycle greenhouse gas emissions resulting from biofuel consumption reached 4.4 Mt/yr in 2015. 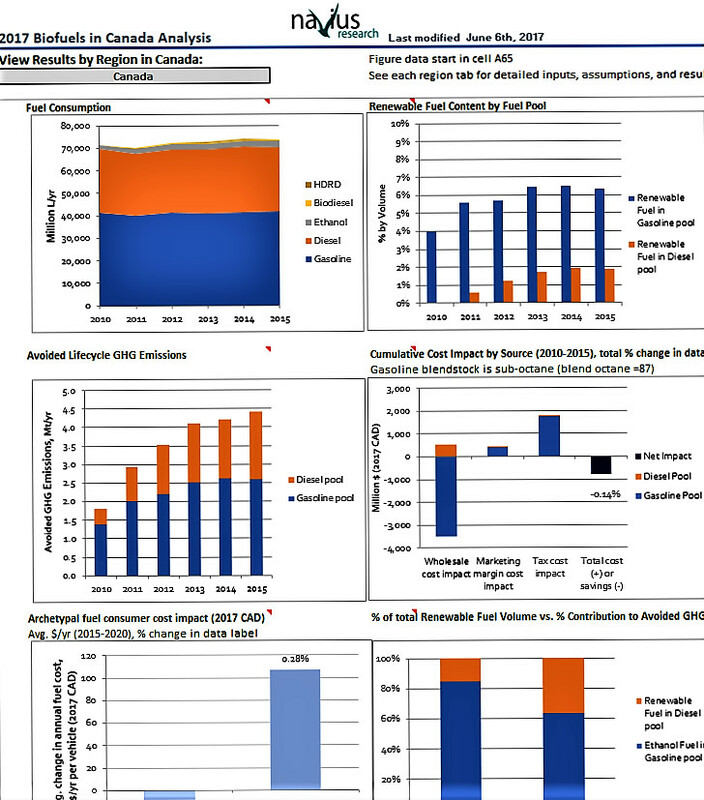 On net, we estimate that biofuel consumption reduced fuel expenditures in Canada by 0.14% from 2010 to 2015, relative to a counterfactual scenario without biofuel consumption. The cost impact is equivalent to an average $8/yr savings for an archetypal gasoline consumer (i.e. private light-duty vehicle) or an additional cost of $106/yr for an archetypal diesel consumer (i.e. a long-haul trucker). Click the image above to download the spreadsheet. Download the report or the spreadsheet model. This study was commissioned and funded by Advanced Biofuels Canada. You can view their press release here. To learn more about this research, please contact Michael Wolinetz.